I know that this is a seriously weird question but I just had to ask it. I’ve never seen an animal with eyebrows… until today. Meet Sam, the cat with eyebrows. I love mochi – a lot. Last week, at Sala’s party, I had deep fried mochi in soup for the first time. It was absolutely delicious! Now I’m on a quest to try every type of mochi that’s ever been created. A Big Ben miniature displayed in LEGOLAND. All Star Trek and sci-fi fans HAVE to see this new movie! Have you ever had a goldfish as a pet? 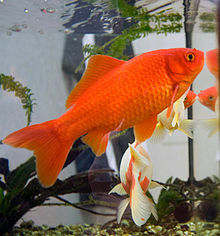 After reading a current news story in the National Geographic about a gigantic goldfish, I was reminded of my own pet goldfish from oh so long ago. When I was in elementary school (maybe eight or nine years old) I went to a small fair on a class trip. Check to see how much common sense you have by taking this little test that I made up. There are only two possible answers – true or false.